Kitchen Overlord's Illustrated Geek Cookbook | Nerd Much? If there’s one thing we know for sure, it’s that EVERYONE loves food. In fact, nothing beats a great meal. But what if those meals were of the extra nerdy variety? Introducing Kitchen Overlord’s Illustrated Geek Cookbook, a masterful creation by Chris-Rachael Oseland containing truly unique recipes revolving around all things geek. How about Deadpool’s Chimichangas? Spice Stuffed Squash Sandworms, anyone? How about the Eye of Sauron, made out of delicious crescent dough, pasta sauce and meatballs? Each recipe contained within the Kitchen Overlord’s Illustrated Geek Cookbook is beautifully illustrated by artist Tom Gordon, and each recipe is easy to follow. The recipes aren’t limited to just one aspect of nerd culture, either, as it spans 120 years of geek culture, including Sci-Fi movies, fantasy books, comic books, video games and so much more. Most of the recipes create kid-friendly meals as well, and they’re fun to create. 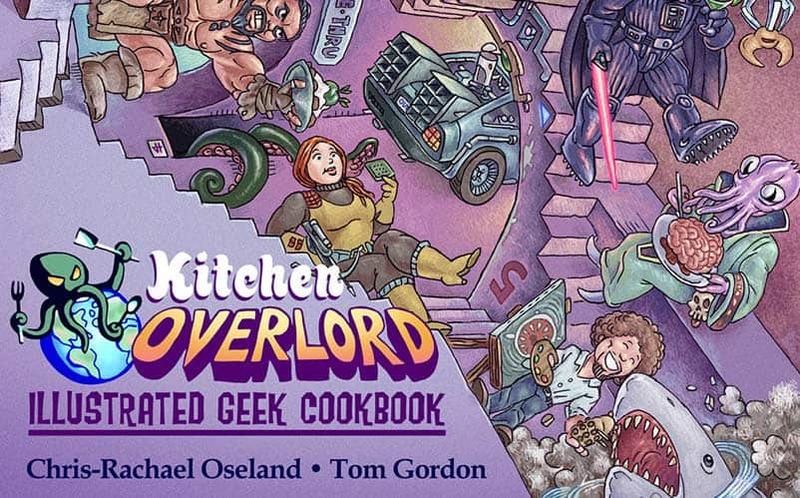 The Kitchen Overlord’s Illustrated Geek Cookbook basically serves as a comic book cookbook, and we’re 100% behind that idea. For more geek recipes, like a Dalek Caprese Salad, check out Kitchen Overlord’s website. And, as always, stay tuned to Nerd Much’s Cool Stuff section for more cool nerdy things.